Today we discuss the process of successful Employee on-boarding. We also give some tips on what you can do to make the process efficient. Lisa: Welcome to another edition of Small Business Spoonful’s. I’m Lisa Smith. Mason: And once again, I’m Mason Merrell. Lisa: And today we are talking about successfully onboarding new employees. 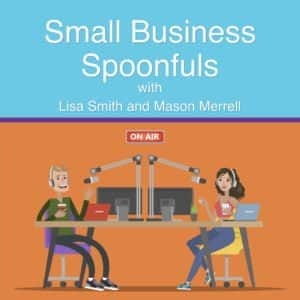 Mason: If you are bringing on employees that that new employees, that process can be kind of a difficult one, for you, for the employee, but you want to do it in a successful way so you start off on the right foot with this employee and hopefully it’s somebody you’re going to keep around for a long time. Lisa: Yeah. And they will want to stay if you start them off on the right foot. Lisa: Now onboarding is not really a new conversation, but the way we’re talking about it these days is kind of new because, okay. So, I’m Gen-x and Gen-Xers were brought into the workforce with, you know, we were latch key kids, our parents worked, we came home after school and nobody was there. We let ourselves in and we were just basically the figure it out yourself, you know, era of people, right, where our parents before us, they usually had a mom that was at home all the time and so they were more directed and told. Then they turned into parents who you know, were working all the time because they were so driven and directed that they left their kids at home. So like, okay. So, Gen-Xers, we don’t, we’re not good at on-boarding because we were just told to figure it out. So, we just tell people to figure it out. Mason: And so, we’re not starting here at the interview process. We’re starting at the point of You’ve made the offer, they’ve accepted, where do we go from here? Lisa: So, you know, there has to be a compromise on really bringing people on board with a little bit of TLC and not so much figure it out yourself kind of attitude because you know, I mean I guess it’s worked for years. I don’t know. I mean we’ve all been in the workforce, but it hasn’t been happy. Like I know going into the workforce, I wasn’t onboarded ever. You know, like really, I wasn’t really given a good onboarding experience ever. They throw some paperwork at you and they say, fill this out, give it back to HR. And then there’s your desk and then basically figure it out. You know, you’re hired to do this. So, here’s the password to your computer. Like figure it out. Nobody really sits with you and guide you through anything. Right. Figure it out. So we don’t want to do that to people because that’s frustrating. And the generation of people who we have working in the world today are largely now the large bulk of people in the workforce are millennials. Okay. So, millennials have stood up and said, “we want to be onboarded. We’re sick and tired of this, figure it out. You crazy people.” That doesn’t make them weak or anything. That just means that they’re saying the things that we didn’t say for years because we always wanted to be onboarded, but we just never were. Right. So anyway, the compromise here, in my eyes is, to have that face to face, but also use a learning management system. Mason: Yup. And put these things in place before you’re even starting to hire employees and put a good process in place so you can reuse that process every time there’s a new employee that comes in, okay, this is the introductory package, this is what you’re going to learn. This is a training you’re going to go through. You have it all, there’s no scrambling. You have a file you pull out that has everything that this employee is going to go through in this onboarding process. Lisa: I know, I know you guys got the participation trophies we know(laughing) but guess what? The Gen-Xers gave you the participation trophies, the people who hate the participation trophies like created them. So, like we did this to us. Right? So, but that’s what happens though is everybody gets the little badge that says you’re doing a good job. Mason; Yeah. It’s a good way to introduce your employees into a workflow. You know, it’s like they get through all these tasks and it’s not going to be like that in such an organized thing every single day, but they get through all this and then your work starts, you know, you’re in there and that and little introductory period, whether usually a lot of people will do, you know, a few days or a week or even a couple of weeks sometimes, once they’re all done with that, you’re pretty well settled in, into what you expect from them and they expect from you. Lisa: Yeah, exactly. And if you’re using a learning management system you have an onboarding section, you use it for all of that, but you can also put all kinds of other daily workflow on there. Like, you know, that’s a good way to correspond and to keep track of cross functional teams working together remotely. There are so many things you can do that really it’s a little simple, easy piece of technology that your millennial workers are going to love. It’s not going to be hard for your other generational workers, Gen-Xers or baby boomers. It’s really not hard for them to learn. It’s super easy. Mason: It’s a login and then everybody can track what everybody’s doing as well. Mason: Yeah that’s what I meant. Lisa: No, that’s good. That’s a good point. The administrator can see everything. So, you as the administrator, you can assign work and you can check work to make sure it’s done. You can download reports of what work has been done and what training has been taken. You can really manage a large group of people if you have one with a minimal amount of headache. We’re talking about onboarding today, but this spills over into so many areas. You’re setting your employee up to succeed on the right fit from day one. Mason: Yup and if your employee succeeds, you succeed. Mason: Yeah set that PC or laptop up, give access to email, all the accounts that they need, all the logins, everything. So, they have it all right in front of them. There’s no, there’s no mystery in like, “Hey, how do I get this? So what do I do? What’s this?” You know, you want to set it up for them to walk in and get the most production you can. Lisa: Sure. And, and these are little simple pieces of technology. The calendar, the outlook calendar, whatever you’re using. Like these are no brainer pieces of technology, so take advantage of what’s out here. Right? They’re not expensive. They’re just here for you. Also like on day one, employee walks in, now they’ve got all this other stuff that’s been going on. So they’re excited. You know, they’ve already been kind of getting the ball rolling here. Now it’s day one, they’re in, you’re happy to see them, you’re introducing them to fellow team members. The thing I hate, and this has happened to me so many times, is you walk in on day one, you’re told to go report to somebody’s office and they’ll get you going. You go and they’re not there. They are 45 minutes late. So you sit in their office with people walking by going, “Oh, hi, can I help you?” “Oh, I’m new today.” “I’m supposed to meet so and so.” “Oh well I’m sure they’ll be here in a minute.” You know, and you feel like such an idiot. Mason: Yeah, a great way to avoid that. For one, if you’re the supervisor in charge of this, just be on time. Also, you can send an email announcement to your employee saying, “Hey, we’re bringing on somebody new, this is what’s going on , this is their name. So, they understand there’s somebody new that’s coming in. Everybody gets the picture of what’s going on. When you are there in this introductory period, introduce them to people, make them feel comfortable, do whatever they can. If they have a mentor, you as a supervisor introduced them to that mentor, you can be there, not just saying: “Go over there and talked to Bob. He’s your mentor.” You as the supervisor go in and make sure it’s a stated frim thing. Lisa: Exactly. And you know, if there is a building to tour, tour it, if it’s just a teeny tiny little workspace, still tour it. Show them where the restroom is in the break room. I mean, sometimes people just appreciate being told. Even though maybe they could see the sign, but just have the courtesy to show them. Sometimes the first day at work is overwhelming even though you’ve done your best to set them up for success, it can still be overwhelming. You want to have like a brief meeting with them. You want to describe company culture. You’ve already started to do that. But yeah, you want to reiterate it. You want to talk about benefits and how that works and perks and things like that. You don’t want to overwhelm them, but you want to start to introduce what the company is about, how it works, and encourage questions. They’re going to have so many questions, but they may not be able to think about those questions immediately. So, say to them “I know you’re going to have questions as the day goes on. As the first week goes on, please come to me with all those questions.” If you can arrange a lunch with several of their coworkers so that they all get together and it will, if it’s in the break room or if it’s a restaurant, it doesn’t matter. Just eating lunch the first day with the coworkers would be a great way to break the ice. It can feel intimidating to some personalities that are maybe more introverted. In the long run, it will help form a bond that those new employees will feel more comfortable walking in the door and asking for help instead of just sitting at a desk and not doing anything because they’re petrified to look weak. Mason: Yeah and you don’t have to throw a party or anything, but make it a happy occasion that somebody new is joining the team to help everybody this situation because phrase many hands make the load light, the old phrase there. That’s absolutely true. If you start off on the right foot on the first day with this person, then it’s going to help out. Lisa: Oh absolutely and always make sure you have checkpoints along the way. So, just from every part, like the onboarding process itself. So like on day one, “How was your onboarding with your paperwork? Did that go smoothly for you?” Before you even started, they’ve already started filling up paperwork. Right? “So has that gone smoothly? Do you have any questions? Have you turned in everything? Do you need any help with anything? Was there anything we could’ve done differently to make that process better for you?” Then maybe at the end of the first week. “So how was your first week? Do you feel like you met everybody? Was there anything that you feel like we could have done better to make your first week more smooth? Is there anything you need? Have we given you the tools?” It might sound like you are hand holding and babysitting, but what it really is, is it’s giving confidence to your worker and it’s establishing a really nice open chain of communication and a method of getting feedback. You want to keep employees. Mason: Yeah, you’ve got to pour the concrete before you can build the house. You’ve got to lay that foundation with them to make sure that they’re going to be instilled in your company. And if this person is somebody who very valuable to you and you’ve obviously brought them on because you see something in them that can help better your organization. You want to keep that person. As we always talk about employee turnover rate is no good. You don’t want employees turning over. You want to keep valuable employees in your organization. Lisa: Exactly. So, then after that first week is over, hopefully then the employee feels good with their coworkers and is getting to know people, is starting to understand the project or the daily task or the workflow, whatever it is that they’re doing. Maybe they’re in a retail store so now they’re beginning to understand in between customers what’s done, or you know how things are stocked or what the process is for assisting a customer with a certain issue or whatever your industry is, it doesn’t matter. There’s going to be a process behind everything. So hopefully in that first week, two weeks, three weeks, you’re giving them, like you said, that firm foundation, it’s solidifying, and the house now is being built. By the end of maybe the first month or two months, and definitely by the end of the first three months, your employee has now had a chance to really succeed in this job and really start to show that that work you did of laying the foundation is paying off. Lisa: Yeah and you have long-term goals and you’ve set short term goals and you’ve actually acknowledged when they’ve met those goals. That’s going to be part two, it doesn’t even sound like that’s part of onboarding that in that first month or two, you’re still onboarding them. You have to think of it that way. It’s like having a new bab you have them and then they’re doing this thing and this thing and then they’re crawling and then they’re starting to pull up on things and then they’re starting to take a few steps and then they’re running and then they’re driving a car, you know, like, I mean, but like, it’s all a process and you’re holding their hand or you’re continuing to onboard them the Whole way. Right? Mason: This sounds like a lot of work, but most of the time employees are going to outdo your expectations. However, if you start with this good basis for them, in this is what you expect, you’re not going to be surprised by anything. Mason: I’ve been in that situation before. Lisa: Yeah, and I’d probably put you there sometimes(Laugh), but I’m Gen-x (Laughter) I think we’ve all been there before and we all make the mistake sometimes of not being where we should be and on top of our new employee bad at the same time we can learn from those things and if we set up a good process, a good checklist, a good procedure, whatever it is and we really get input and we’re constantly changing it and growing it and fixing it and you know, whatever based on that feedback, then we’ll, we’ll be running a good maintenance program that will take that employee through the first 12 months of their employment and make it like a whole 12 month long onboarding program. So, there’s always something happening. And then after 12 months, consider them to be on maintenance at that point and now they can be the mentor for the new employee that comes in and they can help with those things. Mason: Yep at that point they’re driving the car and loading up the van. I think it’s important to always ask are your employees for feedback on what you’re doing and take that feedback good or bad. I know, we always want to hear good things, but there’s negative things that come along with that too. If they say something like that, don’t get angry, just take it for what it is and look to improve yourself as well. This sounds like a lot of work and a lot of stuff that’s put into getting just a new person on board, but it’s vital for your company and at the end of the day it’s really not that much work. It’s just a lot of check ins and just making sure you’re compliant with your training and things. Lisa: Once you do the work initially and set it up, then it’s set up. It’s, it’s not like you have to set up all the stuff every time. That’s why I say use technology, use a learning management system, put it all online. That way if you just set it up once and then you just enroll people. Mason: If you are looking for some guidance on learning management systems, we charge extra for that, but we can help you out. Get you off on the right foot on all of that. Lisa: Yeah, we’ll give you some good ideas. Just write us at support@HelpDeskSuites.com and we’ll definitely point you in a direction. I mean, LMS, learning management systems they’re not free, but they are affordable and oh my goodness in the long run they save you so much time and money. Mason: It’s a good write off for your organization. Lisa: Oh, heck yeah and plus, I mean, why are you not embracing technology? That’s my question. Mason: Yeah, I mean that’s the way of the world these days. I used the example of pulling out a file, but what I really mean is pulling up a file on your phone or on your computer or tablet, because that’s where everything is these days and it’s just a more effective way to do things. Lisa: It absolutely is. Even if they print something out and you do have to keep paper files on some things, just the fact that you have everything collected into a nice format online that is easy to access, that makes sense to the new person and doesn’t throw them into left field and confuse them. It just makes so much sense to me today. Mason: In an LMS, we can’t stress enough that you can customize it to your organization. You can put whatever you want in there. Lisa: Yeah and this is all about you and it’s not done once and it’s not hard to change it. It’s not hard to add to and take away from, I mean, it’s all so fluid. Mason: There’s a term we always use is work smarter, not harder. That’s where we want to be. Lisa: Yeah, that’s right. Well, we could talk about this all day, but I think we’ve done a good job with this topic. Write us though. Please write us and ask us about this, because if you’re not already using a system like this and you’re not already onboarding people like this, you are missing out and you’re working way too hard. Lisa: …and I’m Lisa Smith, be audit secure! To find out more about us, visit HelpDeskSuites.com/podcast. Don’t forget to rate, subscribe and review on Apple podcasts.